Gold producer Randgold Resources (LON:RRS, NASDAQ:GOLD) posted today strong results for its second quarter production and profits, despite the ongoing political turmoil in Mali – where it extract two-thirds of its gold output. The West Africa-focused gold miner, which operates its flagship Loulo-Gounkoto mine in Mali, has also operations in the Ivory Coast and is building another mine in the Democratic Republic of Congo. Randgold’s bullion production came mainly from Loulo-Gounkoto, increasing 16% on the first half of 2011, to almost 376,000 ounces, with net income rising to $245.9 million. Profits rose 10% to $142 million in the period, surpassing the $128 million made in 2011, thanks to the higher production and in spite of a 6% decrease in the average gold price the company obtained. 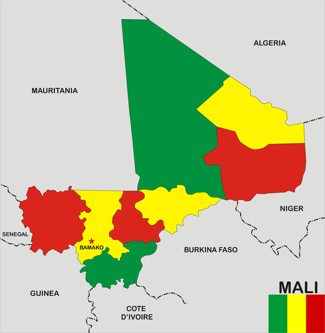 Randgold’s CEO, Mark Bristow, made a distinction between the military coup in Mali last March, which caused a dramatic drop in the company’s share price, and the ongoing instability in the north where both Islamists and rebel groups seeking independence have been fighting the government and each other. The African miner is currently developing its Congolese Kibali gold mine and underground operations at Loulo-Gounkoto as it seeks to increase its gold output to 1.2 million ounces by 2015, compared with just under 700,000 ounces last year.